This graphic illustrates how a foreground star can magnify and brighten the light of a background star. If the foreground star has planets, then the planets may also magnify the light of the background star, but for a much shorter period of time than their host star. Astronomers use this method, called gravitational microlensing, to identify planets. Two telescopes have teamed up to measure of a distant alien world about the size of Uranus that had remained almost a complete mystery since its discovery a decade ago. The exoplanet, known as OGLE-2005-BLG-169Lb, lies about 8,800 light-years from Earth. It was first discovered in 2005 via "gravitational microlensing," a technique that involves watching what happens when a big foreground object (often a star) passes in front of a background star from our perspective on Earth. The nearby body's gravitational field bends and magnifies the light from the distant star, acting like a lens. Getting a read on OGLE-2005-BLG-169Lb has been tough, however, because many characteristics of its host star were unknown. The 2005 lensing event occurred in a crowded star field, which made it difficult to separate the background star from its neighbors, NASA officials said. But researchers have now succeeded in separating the star out, thanks to observations made by NASA's Hubble Space Telescope in orbit and the ground-based Keck Observatory in Hawaii. "These chance alignments are rare, occurring only about once every 1 million years for a given planet, so it was thought that a very long wait would be required before the planetary microlensing signal could be confirmed," David Bennett, leader of the team that analyzed Hubble's observations, said in a statement. "Fortunately, the planetary signal predicts how fast the apparent positions of the background star and planetary host star will separate, and our observations have confirmed this prediction," Bennett added. "The Hubble and Keck Observatory data, therefore, provide the first confirmation of a planetary microlensing signal." Even though Hubble and Keck studied the system 6.5 and 8 years, respectively, after the 2005 lensing event, their data allowed astronomers to determine that OGLE-2005-BLG-169Lb is about 14 times more massive than Earth and orbits 370 million miles (595 million kilometers) from its host star. To put that into perspective: The alien planet is about as massive as Uranus and lies 75 percent as far from its star as Jupiter is from the sun (though OGLE-2005-BLG-169Lb's parent star is just 70 percent as massive as the sun). "It is the first time we were able to completely resolve the source star and the lensing star after a microlensing event," Virginie Batista, leader of the team that analyzed Keck's data, said in the same statement. "This enabled us to discriminate between two models that fit the data of the microlensing light curve." 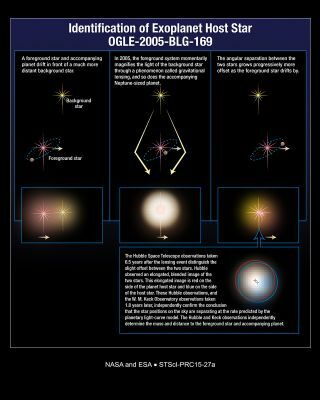 OGLE-2005-BLG-169Lb appears to be a "failed Jupiter" planet, researchers said. That is, it accumulated a large core of rock and ice but didn't grow fast enough to snag a lot of hydrogen and helium, as Jupiter was able to do. “Failed Jupiter planets, like OGLE-2005-BLG-169Lb, are predicted to be more common than Jupiters, especially around stars less massive than the sun, according to the preferred theory of planet formation," Bennett said. "So this type of planet is thought to be quite common." The Hubble and Keck observations could also aid in the development of NASA's proposed Wide-Field Infrared Survey Telescope (WFIRST), a powerful space mission the agency hopes to launch in the 2020s. "WFIRST will make measurements like we have made for OGLE-2005-BLG-169 for virtually all the planetary microlensing events it observes," Bennett said. "We’ll know the masses and distances for the thousands of planets discovered by WFIRST." Gravitational microlensing is not the only technique scientists use to discover alien planets. In fact, two other strategies — the transit method and the radial velocity method — have yielded the vast majority of exoplanet finds. The transit method (used by NASA's Kepler space telescope, among other instruments) involves searching for the tiny brightness dips caused when an orbiting planet crosses its star's face. The radial velocity technique looks for minuscule wobbles in a star's movement caused by the gravitational tugs of orbiting planets. Both the transit and radial velocity methods are best at detecting relatively large worlds that lie close to their parent stars. But gravitational microlensing provides a good way to spot distantly orbiting exoplanets, potentially extending the reach of surveys and censuses, researchers said. The Hubble and Keck observations are reported in two studies in the July 30 edition of The Astrophysical Journal.